Taken from Chapter XI of 'THE RED BERET', by Hilary St. George Saunders, published by Michael Joseph, London, 1951. Lieutenant-Colonel T.B.H.Otway, Royal Ulster Rifles. Otway received his orders on April 2nd and had therefore only two months to rehearse the operation for which he was allowed Carte Blanche. A spot in England at West Woodhay near Newbury, where conditions were very similar to those subsequently to be encountered in Normandy, was chosen. It was good agricultural land in full production, but Otway obtained the use of it in forty-eight hours, though to do so permission had to be obtained from no less than seven different Ministries in Whitehall, a record which should surely stand to The Parachute Regiment. Here in a week the sappers built a scale model of the battery, its shape and dimensions being known to them from the air photographs available. Tubular scaffolding took the place of guns. Not only was the actual objective itself reproduced, so also were the approaches to it. Four mechanical excavators and six large bulldozers, brought on tank transporters from as far away as Liverpool and Plymouth, worked night and day, `the hours of darkness being illuminated by the headlights of vehicles'. To keep the projected operation a profound secret was naturally of the highest importance, and very stringent measures were adopted. No one without a special pass signed by the commanding officer himself could make use of any road in the neighbourhood, and a number of attractive girls, specially briefed for the purpose, were introduced into the area with orders to extract all the information they could from the parachute troops. In this they failed utterly, though the whole plan was known to every officer and man, the only piece of knowledge withheld being the actual name and whereabouts of the battery. Such elaborate precautions interfered with the lives of the local inhabitants, most of whom took them in good part. 'But a number, eager to maintain the rights of property, had to be pacified by drinks in the mess'. Rehearsals by day and night were frequent. Most were conducted with live ammunition, and continued until every one of the thirty-five officers and six hundred other ranks composing the battalion knew exactly what his part was and how to play it. On 31st May the battalion was moved to Broadwell and briefed. The briefing lasted five days, and every man attending was required to submit to his immediate superior his own sketch, drawn from memory, of the position he was to occupy. In addition to the assault by the 9th Battalion three gliders, carrying volunteers from the 9th Battalion and No 591 Parachute Squadron, Royal Engineers, was to crash-land on top of the battery, regarding which a large amount of information had been collected. The guns were said to be of 150 mm. calibre mounted in concrete emplacements twelve feet high and five feet deep facing north-west. The concrete itself was six feet six inches thick, and in addition earth twelve feet thick surrounded two of the casemates. Access to them was by means of steel doors. The strength of the garrison was thought to be two hundred all ranks (it was in fact one hundred and thirty). The colonel commanding them was a new-comer, the previous occupant of the post having lost it through his love of the bottle. This had led him to indulge in many excesses of which the final and fatal was a ride on the switch-back merry-go-round at the local fair near Merville. As soon as he was well aboard one of the cars, the local inhabitants bribed the owner of the switchback to keep it in continuous motion for as long as he could. For upwards of two hours the German Colonel, deathly sick, was whirled up and down and round and round. When at last it stopped he was taken to his billet in a state of collapse. To defend their guns the garrison disposed of several machine-guns and one dual-purpose 20mm. gun. Some twenty weapon pits were plotted on the air photographs. Nor was this all: the position, which measured approximately four hundred yards by four hundred was surrounded by a cattle fence, and a minefield one hundred yards wide, bounded on its inner side by a concertina fence of barbed wire fifteen feet thick and five feet high. Isolated minefields had been laid across all likely approaches to the battery, and an anti-tank ditch, four hundred yards long, dug on the west and north-west. If ever defenders could claim they were holding an impregnable position, the garrison of the battery at Merville could surely do so. Around it on every side were open fields and orchards, much scarred to the south by bomb craters, for Bomber Command had been very active and had attacked the battery more than once, scoring two direct hits on a casemate, neither of which had penetrated the concrete. It was essential for the battery to be destroyed half an hour before the first assault craft touched down on the beaches. The nearest suitable dropping zone was two thousand four hundred yards away, and the earliest moment at which the advance party of the parachutists could jump was 02.00 hours. Were the attack to be unsuccessful the battery was to be shelled by the Navy. It was therefore decided that the attack should begin at 04.30 hours, and the naval bombardment at 05.30 hours, thus leaving the battalion one hour to overrun the position and be clear of it. The plan of attack was elaborate and Otway divided his force into eleven separate parties, each with a definite task. Among them were the organisation party at the rendezvous, the battery reconnaissance party, a breaching company, an assault company, and a reserve company. To these were added the glider assault party of three officers and forty-seven other ranks of the battalion and one officer and seven other ranks of the 951st Parachute Squadron, Royal Engineers. Each man wore a jumping smock with a skull and crossbones marked in luminous paint on the left breast. In addition there were two sniping parties armed with Bren guns and anti-tank rifles, and a diversion party, two of whom could speak German (these were armed with Piats and Bren guns), a firm base party to organise the spot from which the battalion was to launch the assault, and finally what was known as the glider element, made up of five gliders carrying special heavy equipment which included flame throwers, two six-pounder anti-tank guns and three jeeps loaded with ammunition, scaling ladders, Bangalore torpedoes, and duralium footbridges. The plan was as follows. The rendezvous organisation and battery reconnaissance parties, ten strong, were to land from an Albermarle, mark the dropping zone and reconnoitre a route to the battery through its defences. Between 00.30 hours and 00.40 hours a very heavy weight of four-thousand-pound bombs was to be dropped by a hundred Lancasters. During the bombing the glider element carrying the special equipment was to land as close as it could to the battalion rendezvous, and have unloaded their cargo in time for the battalion to make use of it when dropped. The taping party was also to land and, equipped with Polish mine detectors, to clear three paths through the minefield. The commander of the reconnaissance party was to meet the battalion at a cross-roads north-east of the village of Gonneville and lead it to the firm base which he had previously chosen, and which was to be about three hundred yards outside the perimeter to the south-east. To cover the battalion a company of the Canadian Parachute Battalion was detailed to be in readiness. The assault itself was to be led by the breaching platoons, three in number, which formed the breaching company. Its task was to blow gaps in the wire, whereupon the reserve and assault companies following the tapes, were to dash through and make straight for the battery, protected by two sniping parties. The main attack was to be delivered from the south-east with a demonstration against the gate facing north. The three gliders which were to crash on top of the battery were to be released at a height of six thousand feet at 04.24 hours, one and a half minutes later a bugle was to sound reveille, whereupon mortars from the firm base would fire star shells to illuminate the target. At 04.28 hours the bugler would sound the `Fall-in', which would be the signal for all fire to cease. The first glider was to land at 04.30 hours, and the bugler would then blow 'Lights Out' to stop the firing of the star shells. Naval bombardment parties in touch with H.M.S. ARETHUSA, ordered to open fire on the battery at 05.30 hours if the assault failed, were to drop with the battalion. As soon as the battery was captured, yellow flares were to be lit, and the battalion would then move off to its firm base, reorganise and set out for the high ground on which stood the village of Le Plein, block the roads leading from Franceville Plage to Le Plein and seize a German headquarters at Salanelles. Such was the objective and such the plan for seizing it. It was explained yet again to every officer and man at the final briefing by the commanding officer. He was followed by the R.A.F. station commander who, having wished them all good luck, committed himself to the rash statement that his pilots had never missed a dropping zone or been late in reaching one. "It was lucky for him," records one who survived to write an account of what happened, "that there was no chance of any discussion on this point after the operation." On the morning of 4th June the Reverend J. Gwinnett, C.F., the battalion's chaplain, conducted a drumhead service, at which a special Pegasus flag, made by the Womens Voluntary Services at Oxford, was dedicated. It was offered by the men of the Permanent Staff of the Transit Camp who, as a result of parachute operations, were no longer fit for action. Gwinnett's discourse, which was most moving, was on the theme "Fear knocked at the door, Faith opened it and there was nothing there." Gale was blunter. "The Hun thinks," he said, "that only a bloody fool will go there. That's why we're going." The glider assault force and the rendezvous and reconnaissance parties took off from Brize Norton and Harwell, the rest of the battalion earlier at 23.10 hours. All went well until four minutes from the dropping zone, when anti-aircraft fire was encountered. This was particularly unfortunate, for many of the pilots, who were already finding it hard to distinguish between the mouths of the Orne and the Dives, began to take evasive action, to the great peril and discomfort of their passengers. A man with an eighty pound load and a parachute on top of it cannot climb quickly to his feet again if he has been thrown down in the confined space of an aircraft's fuselage: and when the green lights came on the men composing many of the sticks were still rolling on the floor. In the result the battalion, instead of being dropped in a concentrated area, one thousand nine hundred yards by eight hundred, was spread over fifty square miles of Normandy, one stick landing as far away as thirty miles from the battery. On the other hand the battery reconnaissance and rendezvous parties dropped at their correct time and on the right spot. They at once set about laying out their lights and signs, and the reconnaissance party moved in darkness towards the battery, narrowly escaping elimination from the shower of four-thousand-pound bombs dropped by the Lancasters. Not one them hit the target but a number of cattle in the nearby fields were killed and wounded. Otway himself, like many of his men, had been flung untimely out of his Dakota as it was taking evasive action. His knowledge of the locality, gained by the study of maps and photographs, enabled him to recognise the spot on which he was about to land: it was a German headquarters. He and two men fell into the garden beside it, and were at once fired upon by the Germans inside who fortunately seem to have been armed with nothing more lethal than pistols. One of the parachutists silenced this fusillade by throwing a brick through the window, which the Germans evidently mistook for a grenade. Otway's batman fell through the glass roof of the greenhouse but was able to rejoin him at the rendezvous. On reaching it Otway found a condition of affairs which might well have quelled a stouter heart. To quote from his staccato official report: "By 02.50 hours the battalion had grown to one hundred and fifty strong with twenty lengths of Bangalore torpedo. Each company was approximately thirty strong. Enough signals to carry on - no three-inch mortars - one machine-gun - one half one sniping party - no six-pounders - no jeeps or trailers or glider stores - no sappers - no field ambulance, but six unit medical orderlies - no mine detectors - one company commander missing. The commanding officer decided to advance immediately." 'A' Company was in the van, followed by Otway and such of his battalion headquarters as had arrived. Then came a small number of the diversion party, then thirty men of 'B' Company with some Bangalore torpedoes. They were followed by twenty men of 'C' Company, the battalion medical officer, and the medical orderlies. This small but very resolute force set out along country lanes and tracks bordered by high banks and thick hedges, on the other side of which could be seen the dim forms of apple trees heavily laden. They halted often to make sure by the light of the moon that they were moving in the right direction, and at one moment successfully slipped by a patrol of the enemy. On the way to the firm base they met, as arranged, the battery reconnaissance party under Maj. G. Smith. They had cut the outer cattle fence, penetrated the minefield, and lain for half an hour beside the concertina wire, spotting the enemy's posts by listening to the talk and coughing of the sentries. During their approach to the minefield an enemy patrol had passed within two feet of the ditch in which they were crouching. They had in due course been joined by the taping party commanded by Capt. Greenway. It had no tapes or mine detectors, had marked the way through the minefield by scratching heelmarks in the dust. These tasks had been accomplished without a single casualty, though the officers and men employed on them had to crawl forward on their hands and knees feeling for trip wires, of which several were encountered. At 04.30 hours the battalion reached the firm base where 'B' Company was divided into two breaching teams, and 'A' and 'C' Companies were joined to-gether into one assault force consisting of four parties, each of twelve men, one party for each gun of the battery. So far the enemy had made no sign, but hardly had Otway and his men reached their firm base when six enemy machine-guns, all outside the perimeter, opened fire, and four more from inside it. There was one Vickers machine-gun with the assault force, and this successfully silenced three of the German machine-guns on one flank, while the diversion party, now only six men under Sergeant Knight, performed a similar task to the right flank on their way to the main gate. At this crucial moment two of the three gliders carrying the special assault party could be seen circling low over the battery, tracer from the 20-mm. guns pouring into them. The third glider had not arrived, for the tow-rope parted early, and it had to land in England to the chagrin of its occupants. The two gliders which reached the battery were piloted by Staff-Sergeants S.G.Bone and D.F.Kerr. Bone's glider, with Captain R. Gordon-Brown on board, had been severely strained in mid-Channel by the sudden opening of its parachute arrester gear. It and its tug, with Pilot-Officer Garnett at the controls, had also been repeatedly hit by anti-aircraft fire, but this did not prevent the combination from circling the battery four times before the glider was released. The plan for illuminating the battery with star shells had gone awry, for there were no shells or mortars from which to fire them, and Staff-Sergeant Bone in consequence at first mistook the village of Merville for the battery. He turned away in time, but landed four miles from the objective. All within disembarked unhurt and under Gordon-Brown presently reached Le Mesnil where they fought for two days in defence of brigade headquarters and then rejoined the battalion. With them was the special flag made by the Oxford Womens Voluntary Services. It was to remain with the battalion for rest of the war and to be carried in every action. Staff-Sergeant Kerr had better fortune. 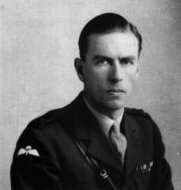 With four men hit on board from anti-aircraft fire, and with his glider beginning to smoulder, he prepared to land in a large field two hundred yards from the casemates. The wheels had indeed touched the ground, when out of the darkness loomed a large white board with the word 'Minen' written on it and decorated with a skull and crossbones. Pulling back on the control column, Kerr lifted the glider over the field and the hedge and sunken road beyond. He then crash-landed in an orchard some two hundred yards east of the firm base. He and his passengers, the wounded included, with Lieutenant A. Pond at their head, stumbled out of the glider, which had lost both wings and was on fire, and immediately engaged a platoon of the 1st/736th Regiment of the 716th Division of the German army. The ensuing fight lasted four hours, but the Germans were never able to come to the help of the battery's garrison. Hardly had the occupants of the glider joined battle, when Otway gave the signal for the gaps in the wire to be blown. The assault parties then moved against the battery, but slowly, for bomb craters, wire and mines strewed the way. Nothing, however, could stop the indomitable troops whose average age was twenty-one - most of them, be it remembered, in action for the first time. In due course they reached the guns and engaged in hand-to-hand combat with the German gunners. These resisted stoutly until one of them happened to catch sight of the badge on the battle smock of a parachutist. 'FALLSCHIRMJAGER', he yelled, whereupon he and his remaining comrades lost heart and surrendered. Three guns were destroyed by Gammon bombs; and one by firing two shells at once through the barrel. The destruction was checked by Lieutenant M.Dowling, though mortally wounded. The success signal was lit half an hour before H.M.S. Arethusa was due to begin the bombardment, and to make certain that their victory should be made known, Lieutenant J. Loring, the battalion signals officer, pulled a somewhat crumpled carrier pigeon from the blouse of his battledress and flung it in the air. It duly arrived in England a few hours later. After withdrawing to the firm base, Otway found that he had about eighty men still on their feet. About thirty casualties were being treated in the battalion aid post, set up in a ruined barn close by. Twenty of them were stretcher cases. One officer had been killed and four wounded, and sixty-five other ranks killed, wounded or missing. The wounded were left with Captain H. Watts, the medical officer, and with a German doctor and two orderlies, who took good care of them. Filled with triumph at an exploit which was of immeasurable aid to the seaborne invaders, the battalion moved off to carry out its second task, the seizure of the high ground near Le Plein. They had not gone far before a Frenchman appeared and warned them that the little village of Hauger on their route was held by two hundred of the enemy. It was now full daylight, and after seizing the cross-roads in front of the village, Otway called a halt. The position to be attacked was a small chateau, loopholed for defence, and surrounded by a stone wall six feet high. It proved too strong to overrun, and the battalion therefore took up a defensive position opposite it, where they were much annoyed by snipers but where they prevented the enemy from moving to the Orne. By then they were so thin on the ground that there had to be an interval of ten yards between each man. It was presently discovered that the garrison of the chateau and the village were for the most part Russians compelled by the Germans to fight for them on the grounds, which they unfortunately believed, that if they fell into the hands of the Allies they would be shot as traitors. The position was eventually captured on the next day by commando troops. Such were the deeds performed by the five battalions of the Parachute Regiment, the 22nd Independent Company and the 1st Canadian Parachute Battalion on D-day. The palm must be given to Otway and his gallant 9th, but every objective assigned had been taken by troops, hardly any of whom had been in action before. Unable to uphold a tradition which they did not possess, they could and did create one. Most praiseworthy of all perhaps, they had in twenty-four hours shown themselves to be of the same stout breed as the men of the 1st Airborne Division.